Facebook has now forayed into the food delivery space. The social network is now bringing the ability for users to order food for pick-up or delivery, directly on Facebook. Users will now be able to order delivery or takeout from restaurant chains such as Papa John’s and Panera, and on-demand services including Delivery.com and DoorDash. 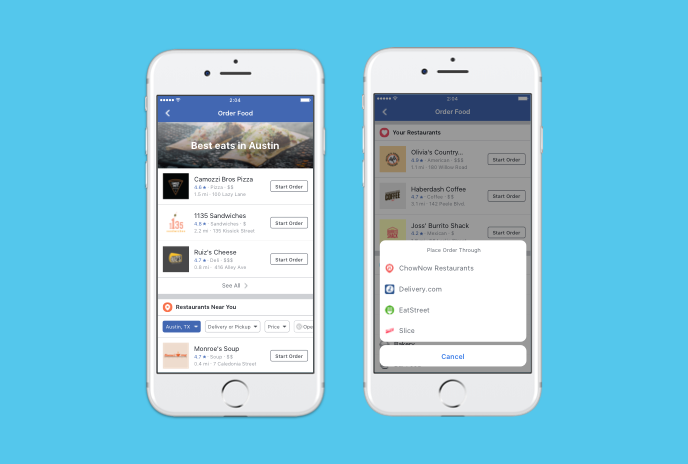 Facebook has been testing this feature since last year and is rolling out the service to users in the United States on its desktop, iOS and Android applications, with new partners. You can browse restaurants nearby by visiting the Order Food section in the Explore menu. On this page, you can browse food options and select Start Order when you have found what you are looking for. The aim here is to allow users to order food without leaving Facebook. People already go to Facebook to figure out what to eat by reading about nearby restaurants, and seeing what their friends say about them. So, we’re making it even easier.